They say if you get lost in the wild, stay where you are. Wandering around makes it harder to find you, and is likely to land you farther from home rather than closer. But it’s so hard to stay put, lost and doing nothing. Wait anyway. The one who comes loves you and will bring you home. You may wonder why anyone would come to the rescue when there are ninety-nine who never went astray. Simply put, it’s not a numbers game: the shepherd loves you and wants to bring you home. And another thing: no matter how many didn’t get lost, home isn’t really home without you. Home comes with you as much as it awaits you. Daffodil shoots started coming up hours after a few inches of the garden bed emerged from snow and ice. Through a four inch snowfall and freezing cold, they continue to grow and green. There are seven or eight green clumps in that small edge of the bed, even though I only planted four or five bulbs in its whole length a couple years back. Who knows how many others will grow when the rest of bed surfaces? Last year, they filled the bed – beauty in yellow visiting this small piece of soil, yielding so much more than was sown. It was a different story three years ago, with just a few dozen green leaves and a stray flower or two pushing through a bed lost to grass and weeds before I called this place home. I took a spade to them one August, hoping to find a few bulbs to fill in a bare spot in the garden. I found hundreds; the bulbs were good but the soil wasn’t. All that potential slept within those bulbs until they found good soil. I couldn’t throw out those hundreds of bulbs, so I planted them in every available spot in my yard – under the lilacs, off the walkway, on the banking – and at the town library. Another hundred or so I gave away. Every Spring, those bulbs that couldn’t grow in poor soil bloom all over my yard; they grow and multiply to grace the library beds; they edge the yards of friends and strangers alike. There must be thousands of them by now. For some digging, soil preparation, and generosity, I’ve had the honor to see the abundance of God. It’s a great interpretation, in general and for this particular time, place, and company. So far, sowing the word is what Jesus does; the disciples listen and receive. But not forever. Two chapters from this parable, Jesus will send his followers out into the world, changing who they are in the parable from fertile ground to sower. I love this parable, but my fondness for it can blind me, keeping it boxed up in one tidy little understanding. I do my best to be fertile soil, to let what is given take root and grow through my thoughts and actions. It’s amazing what can grow. And it’s not just me. I’ve seen so much abundance in the lives of others. From little seeds great crops grow. Here’s my question about this parable: am I meant to remain the soil? Jesus didn’t let his disciples stay soil. When they were ready, he sent them out to sow, scattering far and wide the good news, two by two. This world needs sowers just as surely as it needs soil. When the time comes, will I let go of fertile soil to become the sower of holy seeds? To be honest, parables have never made much sense to me. Even after they are explained, I still do not completely grasp the message. Yet, there is something about this parable of the persistent widow and unjust judge that grabs me…something I understand. I picture Jesus sitting in a circle with his disciples telling the story of a widow asking a judge for what was rightly hers. The judge did not give the widow the time of day. He did not care about those most vulnerable or about what God thought. Day in and day out the judge went to work, and day in and day out, the widow showed up advocating for her rights. Finally, when the judge could not listen to her another minute longer, he granted what was due her. How I admire the widow! I struggle to find my voice; she consistently spoke up for herself despite her situation. I give up at times when things get too difficult; she remained steadfast and refused to quit. I question my feelings and beliefs; she never changed her mind or thought herself unworthy. She persisted in her action and held on to hope. And in the end, an unlikely judge was just. I am grateful for Jesus’ words this Lent. He reminds me what is important: incessant prayer, eternal hope and persistent faith. When I find myself getting discouraged or feeling a bit hopeless and unworthy, I will think of the widow and remember that our God of justice hears me and stands up for me. If such unlikely characters as the judge and the widow could take action, why can’t I? Offered by Heidi Marcotte, mission adventurer and truth seeker. This has been my parable of choice lately, keeping me hopeful and diligent as I work to keep my local library open. The board of selectmen reduced a thriving town service to a decertified, eighteen hour a week ghost of the library’s former self. No matter that it’s a necessity to townspeople of all ages and a resource for surrounding towns. No matter that hundreds get a head start on learning at every story hour, are guided through their first research projects, apply for jobs on the computers, borrow books and movies, and prepare for high school equivalency tests. It doesn’t seem to affect the selectmen directly and it will be years before test scores dip because the library isn’t adequately funded. Library supporters attend the weekly selectmen’s meetings. They speak up, telling the town leaders why the library is important – and why crippling it does the town an injustice. No yelling or name calling, just a steady, constant plea for restoring a vital service to the town. The selectmen are sick of hearing about it – when a thirteen year old spoke, they didn’t bother to thank her for her time and interest in town services. Rude behavior if not outright unjust action. Yet, it’s working. There’s a long way to go, but some movement in the right direction. Not because of a change of heart or a sudden epiphany – it’s just something the town officials are sick of hearing about. With enough patience, justice and common sense will prevail. It makes me wonder about the unjust judge. Does he really have no fear of God or respect for anyone, or is he just looking for an excuse to do the right thing? Perhaps the same can be said about my town leaders. I have faith that it is so. The fish had barely spit him up when he started complaining about his lot in life. And what is he angry about? God’s mercy toward a city full of people. He’d rather die in the desert outside the city than rejoice for the thousands of people and animals who thought better of their ways and promised to change. He’s more concerned with the shrub. Jonah: a rescued prophet with little compassion and an amazing lack of perspective. I think God was trying hard not to laugh at Jonah and his tantrum. Like a mother, God gives a bigger view of reality than Jonah wishes to have, perhaps hoping that Jonah will find mercy in his heart without the help of another three day fish retreat. He said to them, “Pick me up and throw me into the sea; then the sea will quiet down for you; for I know it is because of me that this great storm has come upon you.” Nevertheless the men rowed hard to bring the ship back to land, but they could not…so they picked Jonah up and threw him into the sea; and the sea ceased from its raging. Being a prophet isn’t easy. There’s no guarantee that people will listen to you; if they do, there’s no guarantee that they won’t kill you. Nineveh was Assyria’s capital city – not exactly the place that a Hebrew prophet wanted to go with a message of doom for foreigners who followed other gods. So Jonah ran away from his job and his Employer, clearly hoping that the prophet who runs away lives to preach another day. Except Jonah forgot that the sea belongs to God. The sailors weren’t Hebrews, but they were God’s, too. The wind, the rain, even the fish: all God’s. You can’t run from God, because everywhere you can think of, and all the places you can’t, belong to God. A fierce storm, lost cargo, casting lots, a few prayers, and a toss overboard; the ship is safe but Jonah is lost. Except Jonah forgot about God’s love and sense of humor. Out of the deep and into a fish – the most famous biblical time-out ever. When he’s ready to be who he is and bring God’s message to Nineveh, Jonah lands on dry land. I wonder who was happier: Jonah or the fish? When I run away from who I am and who God is, I probably won’t get swallowed by a fish. At least I haven’t in the past. But I have found myself in a dark place with plenty of time to rethink my choice. Who’s to say that’s any less humorous or miraculous? 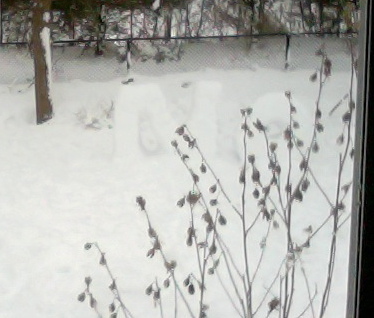 There has been a large, white, NO in my back yard for some time, fashioned from the snow that fell in one of the numerous storms in February. My sons made it when the snow was soft; single digit temperatures and a light ice fall made it impossible to knock down with mittened hands and boot-encased feet. With no thaw in sight, the snow NO wasn’t going anywhere. Yesterday, my sons took a different approach. 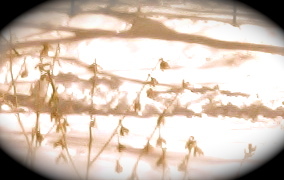 They slid the blade of the grass edger into the icy snow, eventually cutting through. The letters’ own weight toppled them. After that, it took little time to turn the NO into a pile of snow lumps. I think Nathan did the same, slipping a parable into David’s denial, knocking it over incisively – without brute force. David’s deception and denial toppled from its own weight once Nathan’s parable found its mark. That’s why this story was told and saved: it felled the dangerous self-delusional NO of a holy flawed man when a direct blow couldn’t. It does the same today for me and countless others. That makes it sacred. Indeed, how easy it is to see that speck in the eye of others and miss the 2×4 in my own eye. But how brilliant is Nathan! If he had made the parable too obvious he would undoubtedly have risked the king’s ire or at least raised his defensiveness or generated excuses or denials. But Nathan nailed him! No wiggle room here – “You are the man!” Those prophets were a pain, generally going around telling people what they didn’t want to hear – the truth. And so I pause to look inside and ask: Am I fortunate enough to have a prophet in my life? Am I open to hearing about my 2×4 or am I too busy finding fault in others? Lent is a good time for me to face honestly what is going on in my life. Not just to beat myself up but to open myself up, be vulnerable, accept the forgiveness I need and move on to Resurrection Day. Anybody care to join me? Offered by Bill Albritton, companion and sojourner on the road to Jerusalem.